Next generation glasses with activity-tracking technology. ​VSP members: Did you know you can apply your vision benefits to buy Level smart glasses? Oakley and Ray-Ban glasses are available with your prescription. ​Come see our expanded selection of sunglasses and everyday prescription frames. Blue light is a high-energy light source emitted by today's digital devices and energy efficient lighting. Research has proven exposure to blue light contributes to serious eye and health conditions including; eye strain, vision loss and sleep disruption. 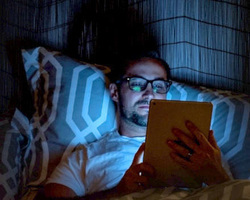 Because blue light's impact increases when your eyes are closer to the source, the following devices are concerning; smartphones, tablets, TV's, computers, laptops and CFL and LED lighting. Blue light protection is now available for prescription and non-prescription lenses. WHO WILL BENEFIT MOST FROM DAILIES TOTAL1® CONTACT LENSES? You want highly breathable* daily disposable contact lenses for white, healthy-looking eyes.